Start your day at Green Island where the Great Barrier Reef is just a short way off the beach, includes your choice of snorkeling equipment or a glass bottom boat tour, or pay a little extra and do both. 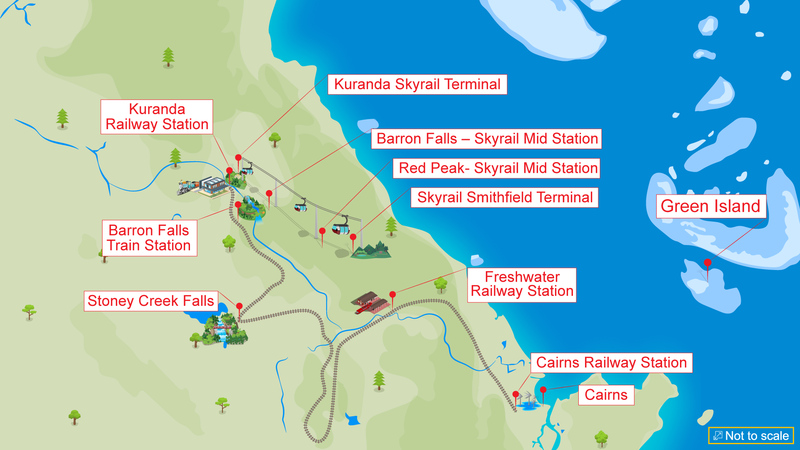 Head back to Cairns and hop on the Skyrail Rainforest Cableway to Kuranda. Spend time exploring the rainforest at the two Skyrail mid-stations. After you have explore kuranda - 'The village in the rainforest' return to Cairns on the Kuranda Scenic Railway passing Barron and Stoney Creek Falls. includes transfers back to you Cairns accommodation. Return to Cairns on the historic Kuranda Scenic Railway. Combine a trip to Green Island with Skyrail - a rainforest gondola journey and the Kuranda Scenic Railway - all in one day. Skyrail is a unique rainforest experience taking you on an unforgettable journey over Australia's World Heritage listed Tropical Rainforest and deep into the forest. Guests glide just metres above the canopy in Skyrail's comfortable six-person gondola cabins which provide spectacular and uninterrupted views of the rainforest, tropical Cairns, the Coral Sea and the lush Cairns Highlands. After free time in Kuranda, board the famous Kuranda Scenic Railway, a spectacular journey comprising unsurpassed views of World Heritage dense rainforest, steep ravines, picturesque waterfalls. the awesome Barron Gorge and boasts spectacular views over Cairns. Morning coach pick up service is not included in cost. A morning coach pick up service is available, at additional cost, from all accommodation houses in Cairns and the Northern Beaches, excludes Holloways Beach, Crystal Cascades, Yorkeys Knob & Lake Placid. Sunscreen, hat, sunglasses, towel, cash or credit card for snorkel deposit, cash for drinks and snacks. Souvenirs available for sale on board. Special Note: For Combo 2 there is no drop off available to Holloways Beach, Crystal Cascades, Yorkeys Knob & Lake Placid hotels. Morning coach pick up service is available as an optional extra.